Level 2-6 is the sixth level of Donkey Kong Jungle in Mario vs. Donkey Kong. The high score for this level is 32000. The level opens with a cinematic showing Mario throwing a RamRam on to spikes so he can collect a Present. 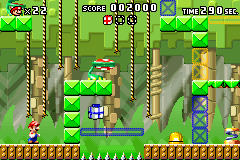 The player starts under some wires they need to use to reach rope above, while avoiding a Tane Pakkun's attack, then use a Monchee to cross to the next platform. The Monchee below them is on the red platform, so the player needs to press the blue Color Switch to make the Monchee fall on the platform below. While avoiding another Tane Pakkun's attack, the player needs to slide down a rope, and then ride the Monchee's tail to cross the spikes. Across the spikes, the player needs to throw a RamRam on to spikes to use it as a platform to carry the Key to the locked door. In the second area, the player needs to climb and jump ropes to get around the Tane Pakkun that's above the spikes. Across the spikes, the player has to press a yellow Color Switch. 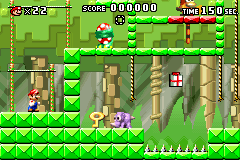 The player can then either climb back up the ropes or use Springboards to reach the Mini Mario by going through the passage on the left. Red: In the first area, in the path of the second Monchee. Yellow: In the second area, next to the second Springboard. The red Color Switch needs to be activated. Blue: In the second area, above the spikes. The blue Color Switch needs to be active. This page was last edited on April 14, 2019, at 15:43.